With the stated goal, “To inspire youth participants’ creativity as well as their social and cultural productivity through the art of music,” Jackson Street Music Program is the brainchild of Dr. James Gore, a local marketing executive with a strong community focus. The Music Program provides free concert tickets to students enrolled in its program, backstage meet-and-greet with artists, and seminars related to the music industry. These are accomplished under the umbrella of Jazz in the City concerts and also an innovative approach using the alternative radio format, namely his New Urban Unlimited weekly radio program. How did James Gore end up in Seattle? He grew up in Detroit and was recruited to come to Seattle University on a basketball scholarship. And that start at SU turned into a bachelor’s degree and then a Master of Public Administration in 1989. As a professional in public administration, Gore worked on political campaigns of prominent African-American candidates in our region, especially those of Jesse Wineberry and Norm Rice, Seattle’s popular mayor from 1989 to 1997. Using the platform of study for a doctorate in education in 2001, Gore wrote about how the music world intersects with both the public and private sectors and how appropriate marketing techniques could boost a cultural program’s impact. With his infectious, self-effacing laugh, he says his doctorate in education was really about cross-sector marketing. Over the years, he applied his marketing skills toward smooth jazz radio stations, meeting “all the local smooth jazz musicians along the way,” he says with enthusiasm. And then he wrote a manifesto about how youth could benefit from learning and being immersed in music and how this could affect a positive demeanor in every part of their lives. He joined the board of the Langston Hughes Performing Arts Institute when it was run by the City of Seattle’s Parks Department. But Gore became disappointed when he felt there was little consistency in year-round cultural programing for kids and no bridge to post-secondary cultural learning. In an effort to create a lifelong learning situation for the community, Gore established Jackson Street Music Program, which became a non-profit organization in 2005. Along the way, he became deeper involved with his community by joining the board of the Historic Central Area Arts and Culture District. So after a smooth jazz radio career, he endeavored to keep busy with a multi-faceted approach to spreading the word that music is good for everyone. 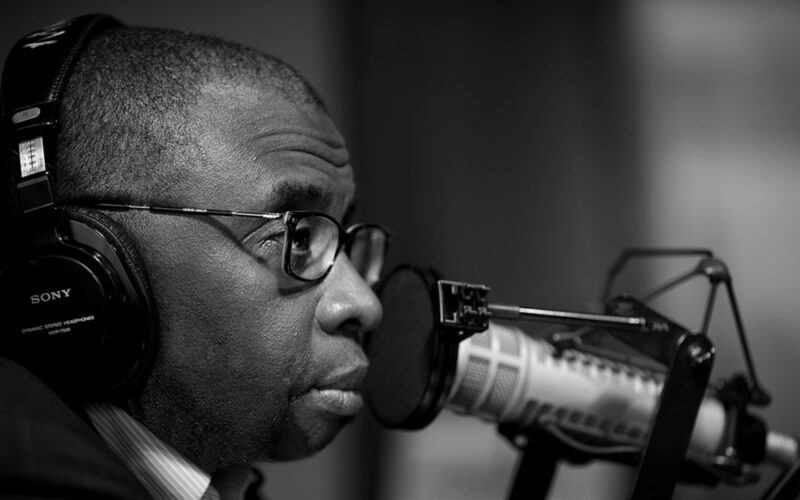 Along came a fortuitous connection to the alternative radio station KKNW 1150 AM, where Gore has established a weekly radio program, New Urban Unlimited, on Saturdays from 1 to 3pm. Some of his outstanding interview guests include Russell Simmons, New York impresario and founder of Def Jam Records. On a monthly basis, one of the programs is produced by two young African-American women who started out as Garfield High School students. That program recently won a small grant from the City of Seattle’s Office of Arts and Culture to work on helping youth to develop their skills in telling their own community stories. As a fundraising mechanism and also for community building, Gore developed the Jazz in the City Program, bringing national jazz acts to the Triple Door venue in downtown Seattle. This past February, Jazz in the City brought together four stellar local musicians with national performance experience under the name of The Folks Project. The group was comprised of drummer D’Vonne Lewis and bassist Evan Flory-Barnes of Industrial Revelation, keyboardist Darrius Willrich (formerly of Digable Planets), and trumpeter Owuor Arunga, who has recorded and toured with Macklemore and Ryan Lewis. And just this May, the Jazz in the City program featured Grammy-nominated vocalist René Marie at the Triple Door. To learn more about Gore’s Jazz in the City program, visit jazzinthecity.com. For information on the Jackson Street Music Program, visit jsmpinfo.org.